The NSU Sport Prinz of 1959 - 1967. Homepage. 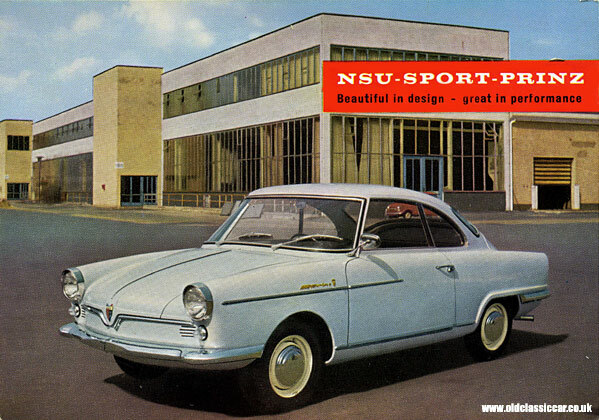 This page: Advertising postcard for the NSU Sport Prinz - Beautiful in Design - Great In Performance. NSU Sport Prinz advertising postcard. Perhaps the best remembered NSU motor-car is the Wankel-engined Ro80, but those looking for a small car in the late 50s and early 60s may well have considered the diminutive Prinz range. The NSU Prinz was introduced in 1957, at a time when bubble cars were still selling well, and there was a healthy market for small cars that could accomodate four people in moderate comfort. The first NSU Prinz sold from 1957 through to 1962, by which time a boxier replacement had already been introduced. In 1958 the first Sport Prinz was launched, featuring a rakish coupe bodyshell designed by Bertone of Turin. In all, approximately 20,800 Sport Prinz were built, powered by the same twin cylinder rear-mounted engine as the contemporary Prinz saloons. In 1961 the boxy 598cc Prinz 4 was introduced, replacing the earlier car altogether in 1962. To look at, there were hints of Chevrolet Corvair (in miniature) in it's styling, and there would be even more in common with the Hillman Imp of 1963, coincidentally also a rear-engined car. Shown here, in the motoring collectables section, is a postcard given away by NSU in the 1960s. It features a smart LHD NSU Sport Prinz, photographed in an anonymous car park somewhere. Just visible in the background is a Fiat 500, suggesting that perhaps this photo was taken in Italy, home of course to Bertone. The first 250 complete cars were built on NSU's behalf by the Italian firm, with production switching to Germany shortly afterwards, with only the bodyshells still being built in Italy from thereon in. Thanks to the car's light weight, it managed a reasonable turn of speed for a car of just 598 air-cooled cc's. Autocar tested a Sport Prinz in 1968 and achieved a maximum speed of 70 mph, just shy of a recently-tested 850cc BMC Mini. However it would be Issigonis' little car, and the aforementioned Imp, that would steal the bulk of small-car sales in the UK during the 1960s, resulting in NSUs being a fairly scarce sight on Britain's roads. Quite how many examples of the sporty looking Sport Prinz made it to our shores I don't know, but there can't have been huge numbers. The rear of the postcard quotes the NSU's top speed as being 85mph, from it's 36bhp, with an economy of ~50mpg being achievable. NSU information isn't extensive on this site, although several owners have found the Sport Prinz page in the classifieds section to be of use (a list of all the NSUs covered can be found here). Return to the Motoring Collectables section for other items of paperwork relating to old cars.